Last night we had a little dinner party at our house. I served Skinny Lasagna Alfredo and this broccoli salad. I’ve had many different types of broccoli salad, but I gotta say, this one is my all time favorite. Next time you want to make a salad, but you don’t want to do the same boring old greens you always do, please consider this one! You won’t regret it! 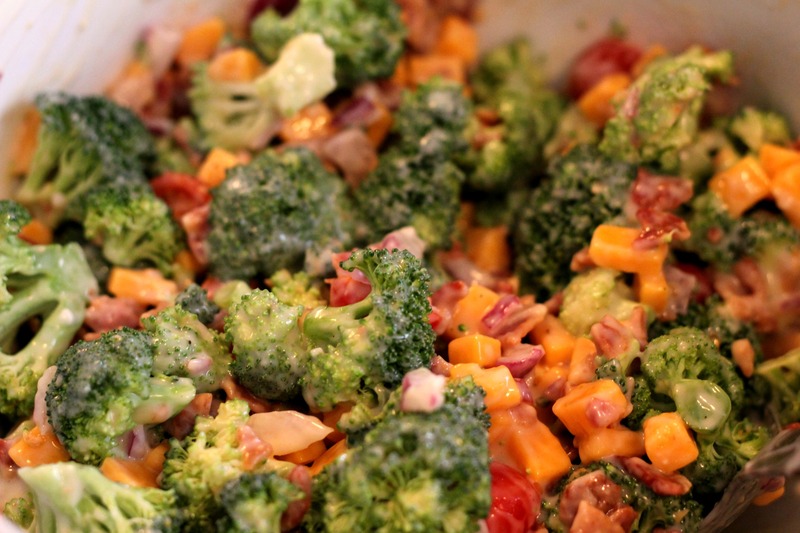 For me, what sets this recipe apart from other broccoli salads is the lineup of ingredients. This has broccoli, bacon, cheese, and tomatoes in it. So really you could stop there and know for a fact that it’s gonna be good. I really liked the dressing for this too. I was afraid it would be too thick and creamy, but it turned out to be the perfect, light consistency and just added a little moisture and flavor to the salad. I really love the colors of this salad! Green broccoli, yellow cheese, red tomatoes, purple onions, it was a verifiable rainbow of deliciousness. It made me wish I had a clear glass bowl to put it in so everyone could see how pretty it is. Cut the head of broccoli into florets and into bite-size pieces. Place in a large bowl. Add the crumbled bacon, onion, raisins (if using), cheese, and tomatoes. In a small bowl, combine the remaining ingredients, stirring well. Add to broccoli mixture and toss gently. This looks delicious, and so healthy! Thank you! Sadly, it’s not really all that healthy, though The cheese, bacon, and mayo kinda put a damper on the healthy factor! But oh well, it was too good to care! We enjoyed this one this weekend! Very tasty. Awesome! I really love this salad I like to pretend that it’s healthy because of the broccoli and just ignore all the other not so healthy things 🙂 It’s just so good! Just use light mayo and stevia for the healthy touch! Lori, you’re right that will definitely help reduce the fattiness! Of course you can also use reduced fat cheese and turkey bacon to really try and slim it down I’m ok with all of those substitutions except the turkey bacon…it’s just not the same! i HAVE MADE BROCCOLI SALAD MANY TIMES I CHOP THINGS MUCH FINER AND I USE RED WINE VINEGAR IT IS AWESOME!